Extended office hours for last day of sale: 9am - 7pm. Online reservations and payments will qualify until 11:59pm PT. 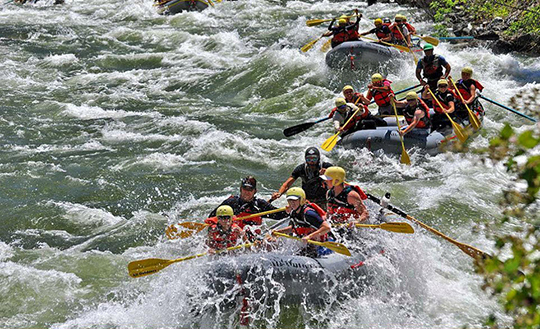 Trip availability subject to water release schedule and anticipated flows. Offer valid on new reservations made by phone or online and cannot be combined with other discounts. In the Spring season months of April, May & June we are treated to more rivers that provide a wider range of both technical and big wave whitewater rapids, along with some stunning scenery - river canyons turn lush green, scattered with yellow poppies and blue lupins. Add this all together, subtract the summer crowds and you’ve got yourself the perfect spring getaway! Which river will you choose? *Spring Sale offer valid on new reservations only and cannot be combined with other discounts. On the last day of the sale, April 30th, 2019, our office hours will be extended to 9am - 7pm and phone reservations must be received by 7pm to qualify for the discount. Online reservations and payments using this discount will qualify until 11:59pm Pacific Time. Our river specialists are available to help by phone, email or live chat.